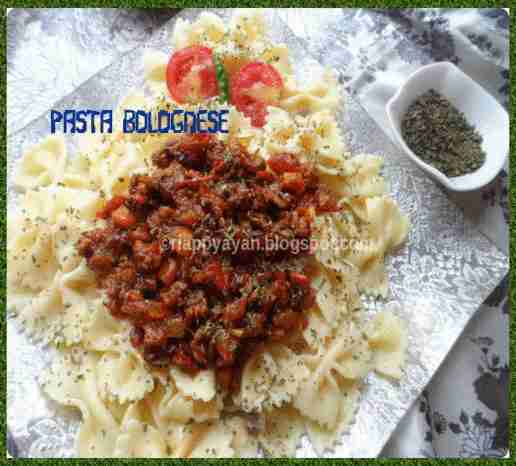 I'm presenting an Italian delicacy : Pasta with Bolognese Sauce today.....This sauce with made with minced beef traditionally and also bacon are added, but I made with minced chicken according to our taste and added ingredients according to their availability in my place. Also the pastas are used in this sauce are spaghetti, tagliatelle and penne. But I think, any sorts of pastas go well with this sauce. It's very tasty, protein-rich, so healthy and filling for any meal. Parmesan cheese : 100 gm. Oil, olive oil preferably : 2 tblsp. Cook your pasta in a big bowl of water with little salt and 1 tsp. oil added until just done. Drain and set aside. Take a deep pan, heat oil, add finely chopped onion, garlic, bacon(if using), carrot and celery. Season with a pinch of salt and oregano. Stir time to time and sauté until veges have softened or slightly changed color. Then add minced meat(chicken, beef or pork), mix well and saute for 2-3 minutes. Now add chopped tomatoes. Saute till tomatoes have softened a bit. Add 11/2 cup of hot water. Season with salt and black pepper to taste. Add finely chopped fresh basil leaves. Bring it to boil and with a lid close it and let the sauce cook in low flame for about 30-45 minutes. Stir time to time. Remove from heat, immediately, add half of the finely grated parmesan cheese in the sauce and keep half for garnishing before serving. Stir and youe Bolognese sauce is ready. 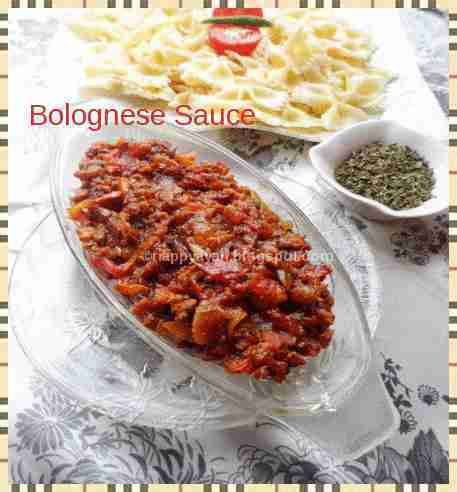 At this point, you can serve your cooked pasta on a serving plate and serve Bolognese sauce on top, garnish with grated parmesan cheese or you can mix the prepared bolognese sauce in a pan with pasta and serve similarly. My my, this is exactly what I wanted to try. I have even bought the bow tie pasta for the experiment. Such a timely post. 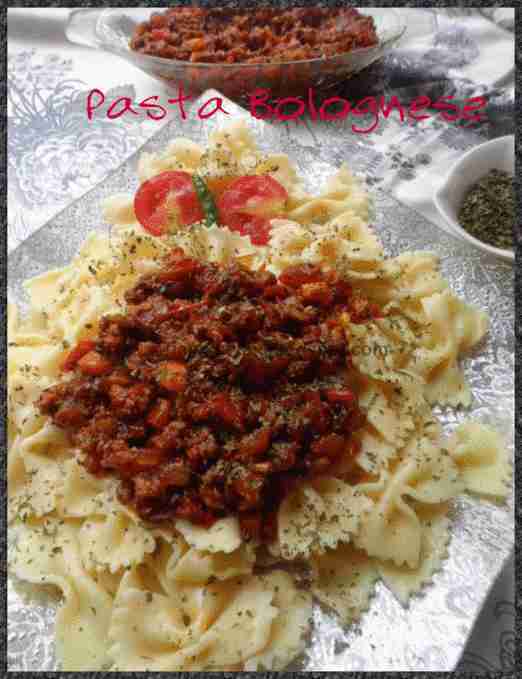 Simply awesome looking pasta with bolognese sauce. Looks so very delicious. One of my son's favorite. Love it. Love to finish that whole plate rite now,irresistible and seriously tempting.Our family favourite.